Summary: To implement the requirement of "The State Council's Guiding Opinions Concerning Deepening and Developing In Integration of Manufacturing Industry And The Internet (State issue [ 2016] No.28)" and "The Action Plan For Deepening The Integration Of Informatization And Industrialization In Shandong(2014-2018)(Shandong EITC info No.255)", and actively promote the industrial e-commerce demonstration platforms, accelerate the transformation from old to new kinetic energy and the transformation and upgrading of economic pattern, after application from enterprises, recommendation from all cities, review by experts and pilot operation. 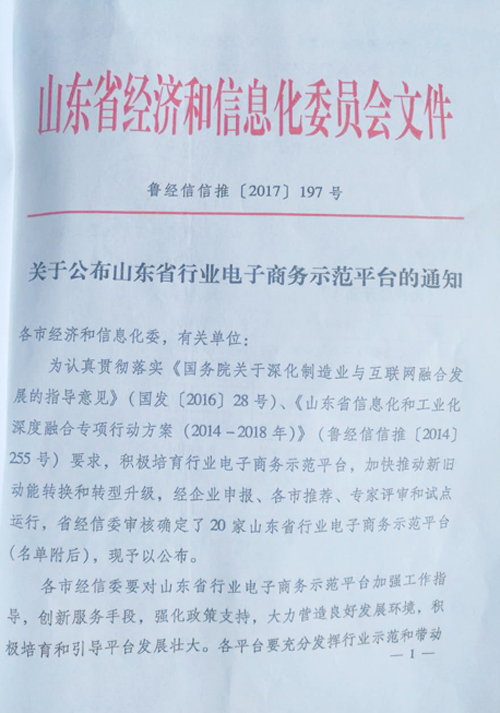 To implement the requirement of "The State Council's Guiding Opinions Concerning Deepening and Developing In Integration of Manufacturing Industry And The Internet (State issue [ 2016] No.28)" and "The Action Plan For Deepening The Integration Of Informatization And Industrialization In Shandong(2014-2018)(Shandong EITC info No.255)", and actively promote the industrial e-commerce demonstration platforms, accelerate the transformation from old to new kinetic energy and the transformation and upgrading of economic pattern, after application from enterprises, recommendation from all cities, review by experts and pilot operation. Recently, Shandong Economic and Information Technology Committee formally issued a name list of 20 industrial e-commerce demonstration platforms in Shandong. The e-commerce cross-border marketing integrated service platform in colliery machinery industry--1kuang.net, which was independently developed and operated by China Transport Group successfully got in. In recent years, China Transport Group actively respond to national policies, and vigorously promote the innovative development in the integration between manufacturing industry and Internet. The Group has independently developed and operated 1kuang.net, www.zgwlwlw.com, www.zgnongke.com, www.cccjyw.com, www.eeyy.com and www.haitao.com, totally six e-commerce integrated service platforms. In which the 1kuang.net as the world's leading and first domestic machinery manufacturing industry cross-border B2B e-commerce platform, fills the gaps in the domestic and foreign machinery industry e-commerce platform, and well promoted the innovation and transformation of the whole mining machinery industry marketing model. The 1kuang.net platform was selected as the MIIT e-commerce integration innovative pilot project and classified as cross-border e-commerce key supporting project by the national MIIT, also many other honors, China IOII innovation and practice award, key e-commerce platform of Shandong province etc, which made outstanding contributions for promoting the innovative development of national industrial e-commerce business. Now, 1Kuang.net was successfully rated as Shandong Industrial E-commerce Demonstration Platforms, which is a confirmation to developing achievement of China Transport Group in industrial e-commerce business from Shandong Economic and Information Technology Committee, and set a benchmark for the whole provincial industrial enterprises. Next, China Transport would make persistent efforts, actively explore a new e-commerce platform development model in the Internet + Era , advance fastly in the direction of informatization, lead the development with technology and innovation for creating new brilliance.